Essays in Honor of Professor L. S. Penrose"
I have just received the following report from Prof Sudip Datta Banik, now in Mexico, on the successful publication of a major new work on Dermatoglyphics. My contribution is Chapter 5, an expansion of a talk I gave at the Yuman University in Kunming, China in 2009 at the 16 World Congress of the International Union of Anthropological and Ethnological Sciences meeting together with the 7th conference of the China Union of Anthropological and Ethnological Sciences. These essays have the ISBN 978-607-9054-01-4. Prof Sudip Datta Banik is looking for reviewers and if any of you are interested in reviewing it, I can forward you a copy of the ebook. It is in PDF format. 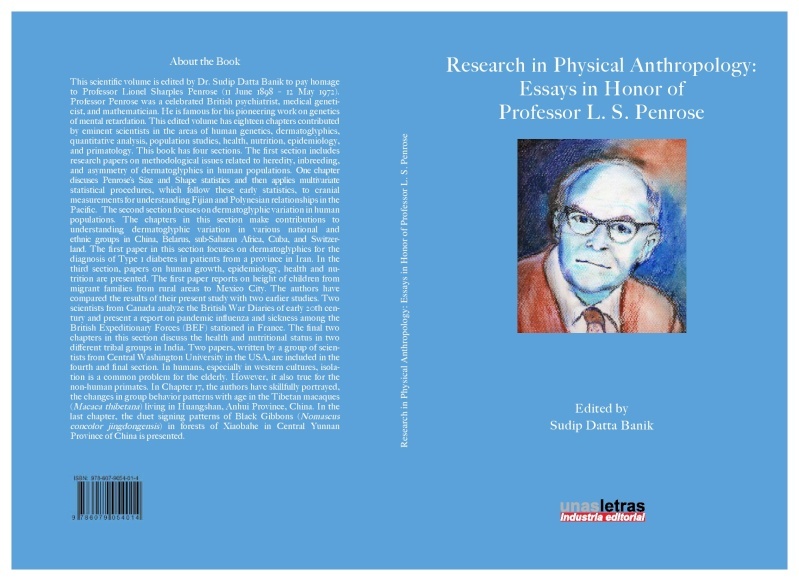 It is a matter of great pleasure to see that our cherished volume "Research in Physical Anthropology: Essays in Honor of Professor L. S. Penrose" is published. I had the information on 20th October from the publisher. The book received high appreciation in its inauguration at the XI Congress of the Latin American Association of Biological Anthropology held at Bogota, Colombia (21st to 24th October, 2010). I was also present there. Re: Essays in Honor of Professor L. S. Penrose"
well done Ed! I would love to read your chapter in this book. I would attach the book cover that you sent me by email, but I don't know how to attach .pdf files nor how to convert them to .jpg. Thanks for bringing the news!! The last link could be a good solution as I seem to recall that cnet.com tests all software that go through their website against viruses and trojans. The reviews also seem pretty positive and it is for free. Alternatively you could use an external website to run the conversion if this is not a feature you will be using regularly.